War is hell, and some of the hell of war seems almost beyond belief. In the case of a Ridgefield man convicted of being a spy during the Revolutionary War, some of the story of his final moments may well be beyond belief. 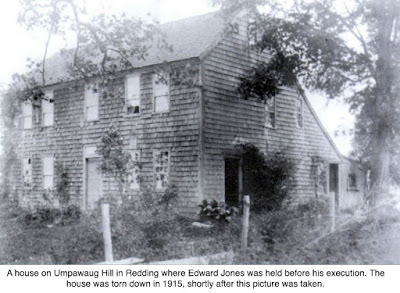 Edward Jones had immigrated to the United States from his native Wales and had settled in Ridgefield in around 1770. Since he had so recently left his native land, it was not surprising that when the war broke out, he felt a loyalty to King George III. While there were quite a few Tories in Ridgefield, the majority of the town had voted to support the Continental Congress (though not as quickly as other area towns). Loyalists were often harassed and sometimes even attacked. Jones was probably concerned for his safety, and after the British took control of New York City, he moved there and became a butcher for the British army. According to later testimony, he was sent one winter day in 1779 into Westchester County to buy cattle to supply meat for the British forces but was discovered behind continental lines in Ridgefield. He was arrested for spying on the operations of General Israel Putnam’s encampment in nearby Redding. Jones claimed he had gotten lost and did not know he was in Connecticut. On the espionage front, Jones was that next offender. Jone’s court martial was convened Feb. 4, 1779, and, “pressured by Putnam’s desire to return discipline to the ranks, was not inclined to believe that he had innocently wandered into the state, especially in the area around Ridgefield that he knew well, and he was sentenced to death,” wrote Daniel Cruson in “Putnam’s Revolutionary War Winter Encampment,” published in 2011. “From the orders, it is clear that there was to be no question of his physical state after the sentence was carried out,” Cruson said. It seems a very humane order. Yet one account of the execution portrayed an event anything but humane. John Warner Barber’s book, “Connecticut Historical Collections,” published in 1838, reported that the hangman had disappeared from camp on the day of the execution, possibly because he found the task distasteful. A makeshift gallows was set up that required its victim to climb a 20-foot ladder and stand on top with a rope tied from his neck to a cross-beam. The ladder would be jerked away, and the condemned man would fall to his death. With no executioner at hand, General Putnam reportedly ordered Jones to jump from the ladder — in effect, committing suicide. Barber’s account says that Putnam then ordered two 12-year-old boys who were somehow part of the audience to knock over the ladder on which Jones stood. The boys then followed the command, and Jones was hanged. Other histories, including Lorenzo Sabine in his 1864 “Biographical Sketches of Loyalists of the American Revolution” and Todd’s 1906 “History of Redding,” repeat this story. However, Todd points out that G.H. Hollister, in his “History of Connecticut,” disputes the account, and cites eyewitnesses, including the Rev. Jonathan Bartlett. In 1855 at the age of 90, Bartlett “well remembers the Revolutionary encampment at Redding and frequently visited it. He is sure that the story in Barber’s ‘Historical Collections’ about Putnam’s inhumanity at the execution of Smith and Jones is incorrect. Finally, James Olmstead of Redding, who died in 1882 at the age of 89, wrote in the Danbury News that his father, “being an officer himself and well known to some of the officers on duty, was one of the few who were admitted within the enclosure formed by the troops around the place of execution and able to witness all that there took place….He was within a few feet of the scaffold when Jones, pale and haggard, was next brought on, his death warrant was read, and he seemed to recognize some few of his old friends, but said very little except to bid farewell to all, and his last words, which were, ‘God knows I’m not guilty,’ and was hurried into eternity. Tradition was that those hanged at the gallows were buried at the structure’s foot, and it’s believed that both Jones and Smith were buried at the execution site on what is today known as Gallows Hill. It’s just east of today’s intersection of Gallows Hill Road and Whortleberry Drive in Redding. I read your article written on March 29, 2018. The title was: Edward Jones: Hanged as a Spy. In the second paragraph you wrote: "Edward Jones had immigrated to the United States from his native Wales and had settled in Ridgefield in around 1770. Since he had so recently left his native land, it was not surprising that when the war broke out, he felt a loyalty to King George III". I am especially interested in where he came from. In your paragraph you wrote he immigrated from Wales to the United States. Can you tell me where you obtained that information? What source? I am interested in Edward Jones and would like to know more about his background. Thank you. Hi Michael Treadwell: One source of that information was Daniel Cruson's book, "Putnam's Revolutionary War Encampment," in which Cruson says (page 73): "During the trial it came out that Jones was born in Wales and was accordingly loyal to the king."